Safely in Bagram, now heading to Kabul..
Hi all! Wow, what a hectic night we endured — well, at least 6 of us as the others stayed behind for a flight tomorrow night! 12:15 showtime after being told at 11:30 we would be heading out that evening!! F*$)%…. Gathered up all my stuff, grabbed the Kevlar vest, helmet, belt and my weapon of choice and hung around the terminal until 2:15 when it was time to load the bus. Pull up on the tarmac and see this HUGE US Air Force plane — a C17 — waiting for us to load! It was amazing. The plane is huge — it had pallets of gear, seats all along the side and 5 seats in the middle of the beast! I wasnt sure how it was going to life off with all the gear and folks, and gas, and just being a monstrosity! I loved every minute of the flight! Picture the AFN commercial where you see the military walking up the back of a plane to load, well, that was the kind of plane I was on — with 135 of my closest military and civilian acquaintances!!! Must admit, military folk are extremely courteous and helpful — especially to the sweaty girl trying to balance her Kevlar vest, helmet swinging from it, weapon on but not with a cartridge, and the dreaded backpack! Helped to get it all off me and plopped down in my seat for the 3 hr 45 min flight! Now it’s time to get on the next US Air Force plane — I believe this time will be a C130! Sorry, no pics allowed on the flight line so have nothing to show of the movement from Kuwait to my in-processing center. First thing I noticed when we got off the c17, it feels about 85 here and is much more pleasant than Kuwait! Damn, it was HOT there! Once I am settled in Kabul, I’ll need to shower – won’t even tell you the last time that occurred — and then I will update my living arrangements there for the next three days! Thank goodness for travel fresh wipes is all that all of us girls are saying at this time. :-). Happy Tuesday!! Yeppers, reported when we were told to and were given the news that “you shall wait another night, report back tomorrow evening at 8:30!” I am beginning to dig the hurry up and wait philosophy, as there is nothing else! If only I could get my pic to upload (internet connection is sloooooooowwwwwww), I promise my digs aren’t anywhere near as nice as where I wish I was still sleeping!!! 🙂 Will get pic up soon. After a very long day, I am finally in Kuwait! Flew on a MilAir Flight on Delta out of Indy to Hahn, Germany for refueling! It was great to stop there b/c I was able to touch base with a few friends prior to reboarding. Then, back on the bird — yes, in the extended leg room in row 5, but not like the way Uncle Craig and Michelle hook me up every summer — no business class, just extended leg room. The perk of being a DoD Civilian and not a contractor, being called first to board the plane — with open seating! Finally, it is time to head out…. I am a new Aunt the day before I head out for the next year! Congratulations to my brother, Sean, and his wife Julie, as they welcome Cali Kennedy Dorsch — 7 lbs. 12 oz. this evening! Cali being so close to Kelly, guess we can all figure out who is the favorite sister!! ha ha ha Thanks Seanie Bawnie, you are the best brother ever!! After being delayed for a week, we have a 6:30 am call for luggage, get weighed (yes, my body with my backpack — oh boy), then we will receive our protection (and no, not what sailors receive when they have a port of call!). Sit and wait for transport to the airport. I’ll either be in Ramstein or Shannon for refueling — so those in Germany, I still have my SIM card and you just may receive a phone call :-).. It will be a long day, and into the next, as the adventure begins to my new duty station! Hopefully internet is up and working 24 hours from now. Thanks for all the comments, emails, and well wishes! Here is to the beginning of a new chapter! Ah, don’t you just love the Waffle House? Gotta love the DQ, too! Rockin’, promise, we will go again! I have been rather quiet in updating and thank you for being patient! July 5th headed to TX and went back to work immediately learning about my new curriculum. Very interesting to understand what adults go through learning to speak English and how those higher-ups would like us teaching others to speak/read/write English. Gerunds, modals, passive voice, adjective clauses to adjective phrases, the use of as if and as though, negative tags (yeah, google that one and then it’s not so bad)… Grammar, oh grammar — I will know grammar inside and out after my year-long adventure. After working all week, Dad and Dee made it to TX to visit. Fantastic having them out there for four days and we were busy, busy, busy. Downtown on the River Walk, quick view of the cathedral, off to Mercado Square for some authentic cuisine and artifacts. Stonewerks for dinner with a very good friend from Florida — so good that we all went back on Sunday evening for another try! IMax theater to view The Alamo and then off to the Alamo with all the other tourists — interesting how “small” the remnants of The Alamo are today for all the tourists to view! Love that Dad and Dee came out to visit and was great to see family once again before beginning my new adventure. I wish I could upload a pic but I have to say that it was pure luck on the last two postings and I promise to keep playing around until I figure it out again! Shortly, I believe I’ll have plenty of time to do such a thing! Happy Weekend to you — I believe I will be fortunate enough to see familyonce again this weekend since we are delayed on our departure! More later…..
Take care and I enjoy reading your comments! In time, I will comment on those too! Love my family and am so excited that they came to Indy to visit! Natalie (Natty), Tracy (Tracer Lynn), Mom, Damion, Bayleigh, and Maddox — An evening of laughs at the Outback and then back to the hotel to have my teenaged niece and nephew, along with my eight year old nephew, school me on my new iPad! Boy, I wish I could package them up and keep them close by for more personal lessons! 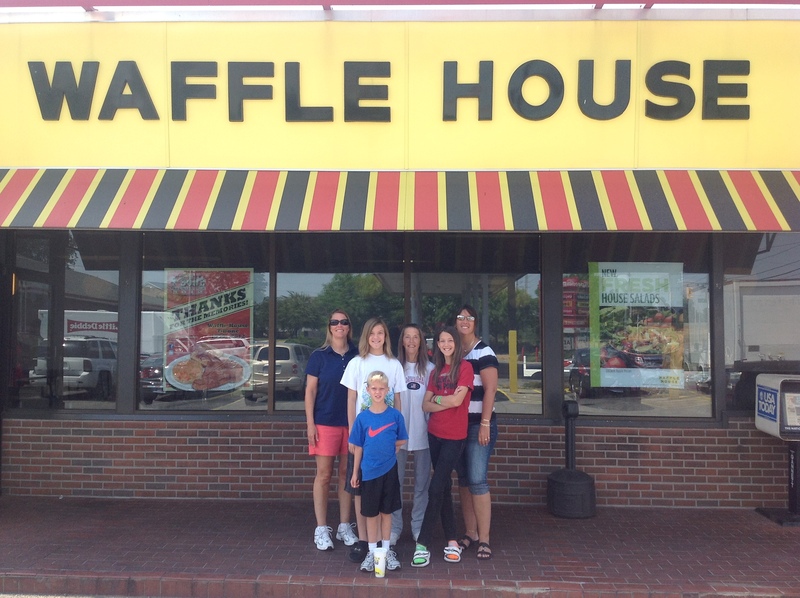 Breakfast at the Waffle House — my favorite, sweaty afternoon at the Children’s Museum (yes, the power went out and we received a full refund after being there for two hours), so it was off to go cart racing and putt putt golf! Mom schooled all of us and won the 18 hole course! Damn, it was hot out there! 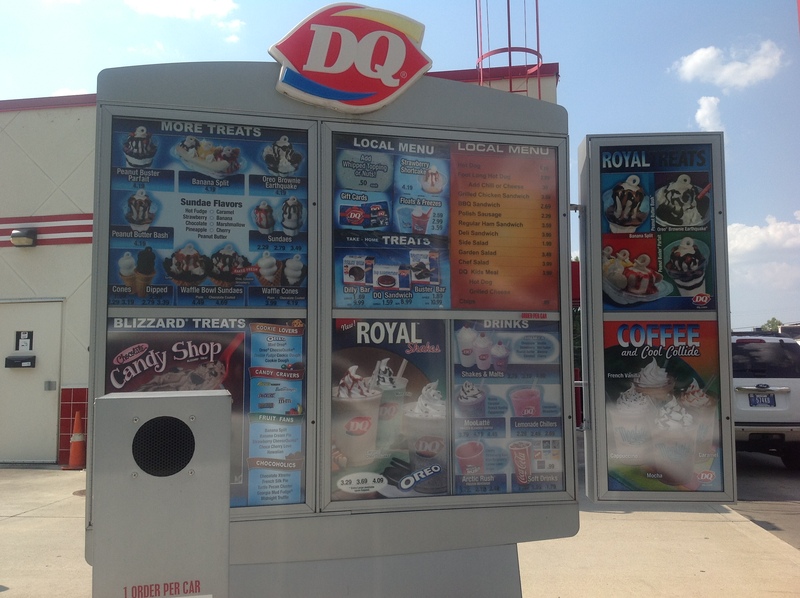 So, in order to round out a great day, our second to last stop was …..are you ready, DAIRY QUEEN! Yes, my first blizzard since August 2011! Although it was mistakenly made with left over chocolate syrup left in the machine, I was still able to devour the entire blizzard! Rockin, we’ll have one summer of 2013! Last stop at the outlet mall b/c on the 4th everyone should do a bit of shopping before the fireworks begin — and then it was a teary “see you later”! Miss you guys so much and love you!! Sure hope you all had a great 4th! Promise, pictures soon but yes, still learning how to upload!! Teaching, Birds and Mock Safety Zones! Drop off at the landing area and off to the convoy to school! Meet my students in our mock setting and begin teaching “get in, get out, get on, get off, get (to)…. oh my, funny funny funny as they want to know why we say “get on the plane but get in the car”…. oh my, and the craziness of the English language takes over in a mock run! Yep, had an intruder but b/c we were well trained by a Sgt. 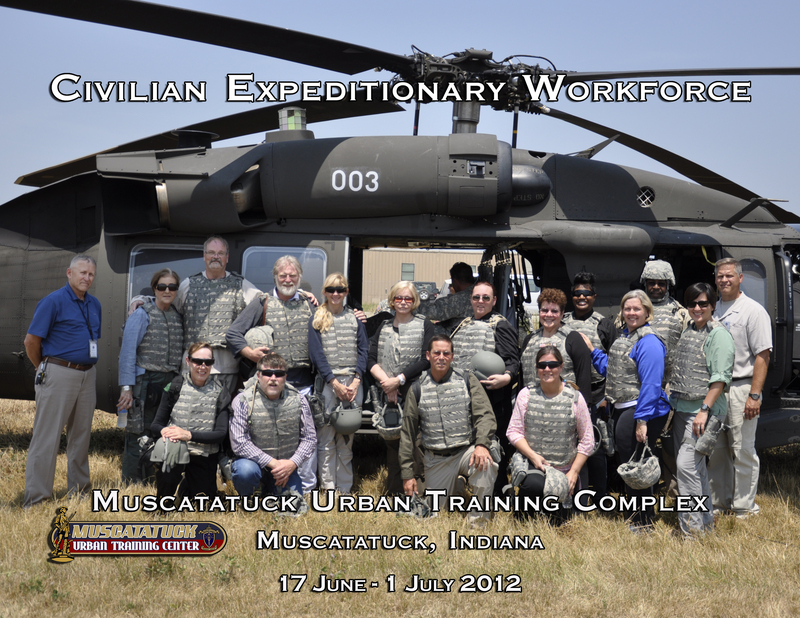 Trainer (he is wonderful, patient, and knowledgeable), we were in our “safe zone”, dressed properly, and no drawn weapons! Always a plus…..